[The disciples] had rowed three or four miles when suddenly they saw Jesus walking on the water toward the boat. 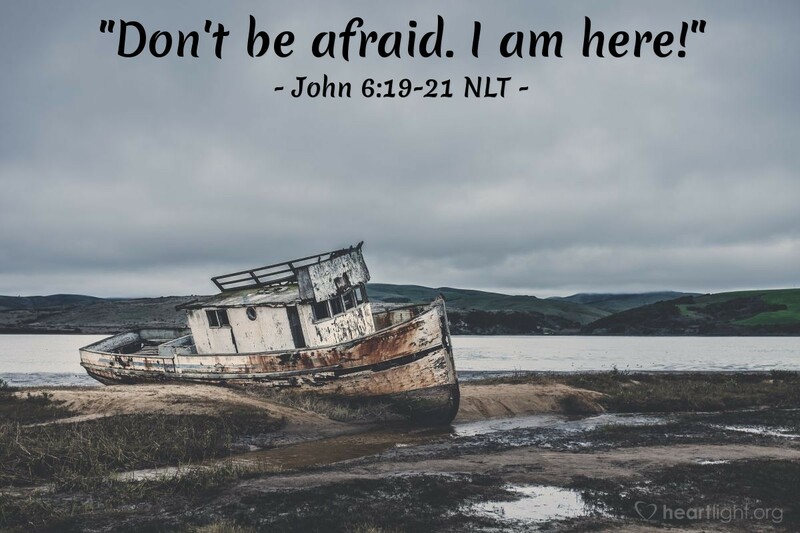 They were terrified, but he called out to them, "Don't be afraid. I am here!" Then they were eager to let him in the boat, and immediately they arrived at their destination! Sometimes we get so caught up in where we are going that we forget to take Jesus along with us. We try to do things ourselves rather than depending on him. Bottom line: If we don't welcome Jesus eagerly into the middle of our lives, especially in times of difficulty and struggle, we're not going to make it to the place we want to go. Please forgive me, dear Father, when I try to do things by myself and do not depend upon your grace, your Son's presence, and the Spirit's power. I recognize that I will not accomplish what I want to accomplish outside of your grace and without Jesus' presence. I pray in his name, Jesus my Lord. Amen.